Since the launch of the first iPhone, fingers have become the first and foremost pointing device. The time of stylus is past and though a few phones still have them (and in Note series it has been appreciated as well), it has become more luxury than need. This has been a long change since the resistive screens. The substitution of the keyboard with a large screen presented its own disadvantages. The first is that the part of the phone that can be scratched or broken has increased from one part of the phone to one side of the phone. A drop can now simply make the phone useless. Another is that we do not always have clean hands. In fact, a laptop keyboard is considered one of the biggest germ breeding grounds. The same hands now touch your mobile screen and that screen touch your face… umm… you get the idea. Add to this, that someone else touching your phone and it is a hypochondriac’s nightmare. Corning Gorilla Glasses came with the solution for the first. The screen became a rage with many Android phones boasted of having a Gorilla glass. A fall was still something a person would want to avoid but now the chances of a scratch reduced a lot. 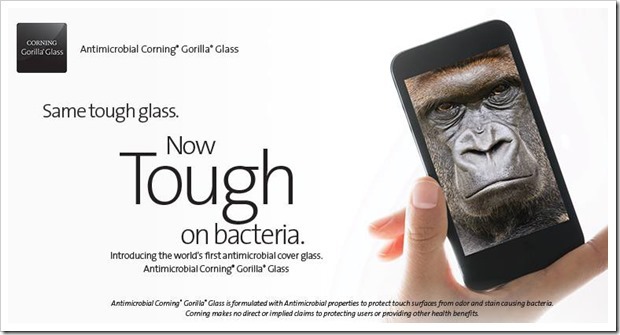 Now, at CES 2014, they are showing their new Gorilla Glass with an antimicrobial agent on it. This agent will kill the bacteria that are forming on the screen in real time. There is no need to swipe anything on the screen, the glass will take care of itself. The glass surface is coated with Ionic Silver, which acts as an antibacterial and destroys the germ formation on any surface. While there is no word on when these glasses will come in the market, we should expect that by next year, most high end and many middle-high end phones should be sporting this glass. What is your thought? Do you consider this a new development or simply a gimmick? A graduate from IIT-Roorkee, Kunal Prakash’s love for technology was at first sight and everlasting. He is currently enjoying the first stint as a professional after leaving over 20 years of schooling. You can follow him on facebook or visit his blog for his other musings. Gmail Rolls Out “Email Via Google+”… Good Or Bad?